This is a guest post written by Georgia Rodgers. Georgia is graduating from Australian Catholic University in Melbourne with a degree in International Development. She is pictured here next to Gullfoss waterfall in Iceland. Ever since I was young, I have always wanted to help people. For as long as I can remember I have had the desire to ‘give back.’ In 2015, I made the decision to ‘give back’ to a community in Tanzania. Writing this now, I feel very uncomfortable to admit my choices. Yet it is so important to share this mistake of mine. Little did I know that my desires were nothing more than something to fill my self-gratification and actually had detrimental impacts on the people I was engaging with. Through my journey into studying International Development, it initially came as a shock to me that volunteering abroad could have such impacts. Although I had good intentions, there was a lot for me to learn and reconsider. Through this long journey of realization, I have seen firsthand the detrimental and traumatic impacts voluntourism can bring to a community & individuals. A typical response I have had, when arguing against voluntourism is the notion that “something is better than nothing”- which translates to a highly undermining viewpoint that means, “if I do not help, no one will.” Through such a viewpoint, young unskilled people are replacing individuals locally that have qualifications and beneficial skills. There is an automatic assumption that people within developing countries have no skill, which significantly undermines people in these nations and automatically gives ‘developed’ nations superiority. During my journey and studies, I have had the privilege of meeting an incredible woman named Claire Bennett. 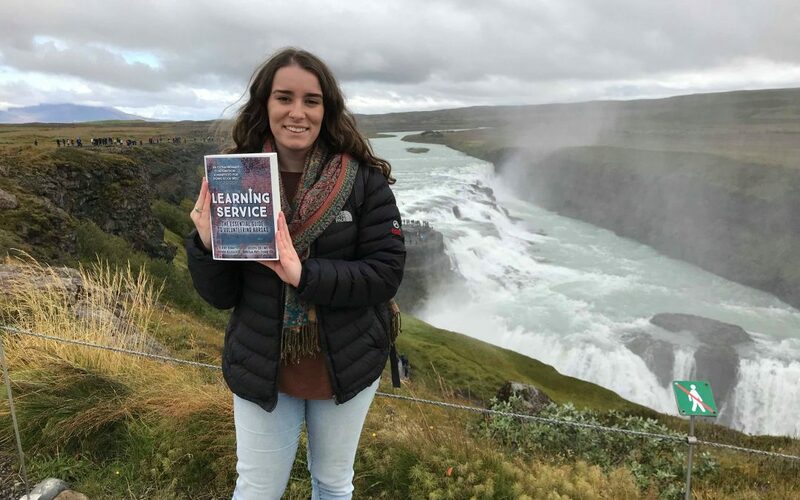 Claire had just published a book she co-authored with three other inspiring individuals, called Learning Service: The Essential Guide to Volunteering Abroad. I cannot stress enough how important and valuable this book is, especially at a time where voluntourism is growing more than ever. A prominent phrase within the book that stuck with me is: “Action without learning is ignorance. Learning without action is selfishness.” Which is a phrase I wish I had known prior to my own ignorant choices when volunteering abroad at 18 years old. Learning Service puts complex issues and ideas into simple words and explains them through illustrative scenarios. People of all backgrounds can understand the detrimental impacts volunteering abroad can bring. It is essential for people to start educating themselves on these issues before getting more involved in actions to help the world. When we know better, we can do better, and Learning Service suggests that we have to learn before we can help. Essentially, it suggests unlearning the western narrative of development (that we are needed to go and help THEM) and relearning a new perspective (it’s about what WE do ourselves day to day). In other words, if you want to give back to the world, you must start with yourself. When we know better, we can do better, and Learning Service suggests that we have to learn before we can help. Learning Service suggests that one way to unpack our assumptions about volunteer travel is to flip the traditional definition of international service on its head. Instead of imagining yourself going abroad to volunteer, consider what it would be like to have these same programs from abroad coming to your own country. Each & every problem in this world is deep-rooted and complex, it’s not as simple as just building a well or teaching children ‘ABC’ 365 days of the year. 10 million people will go abroad this year to volunteer. These are big numbers, with bigger impacts. Even if we all have good intentions, it’s just about educating ourselves first. If you are eager to engage in volunteer travel – this book is for you. I truly wish I had read this book when I was 18 years old. Although my intentions were good, I would have benefited greatly from its lessons and gained a relevant skill first before trying to help. Don’t worry too much about what other people think about you. – For the most part, what other people think and say about you doesn’t matter . When I was 18, I let the opinions of my high school and early college peers influence my decisions. And, at times, they steered me away from ideas and goals I strongly believed in. I realize now, ten years later, that this was a foolish way to live, especially when I consider that nearly all of these people whose opinions I cared so much about are no longer a part of my life. Unless you’re trying to make a great first impression (job interview, first date, etc. ), don’t let the opinions of others stand in your way. What they think and say about you isn’t important. What is important is how you feel about yourself.